"Dance. That's all I want to do." 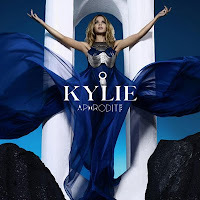 The first words sung on Kylie Minogue's new record Aphrodite really embody the spirit of not only her latest album, but also her entire career. In a lot of ways, this really does make for a nice addition to Minoque's discography. But while Kylie's newest does have a wonderful dance feel to reflect a length career, it might just be stuck in her "Loco-motion" past at the same time. Aphrodite just doesn't quite keep up with the times of pop music. In some ways, this is refreshing. For instance, her voice doesn't have that pervasive Auto-tune sound all over it (though she might use it, the producers don't make it obvious). In other words, her voice isn't the problem. Minogue can still belt it out with the best of them. The beats are entirely another story. It's the music itself that just makes this record seem stuck in the past. The beats in particular feel a little outdated. Though she's progressed a little bit since her 1980s debut, there's a need to get caught up with the new decade. She may have got her act through the 90s and into the early 2000s, but this is 2010 now, and Minogue needs to catch up with the sound. This isn't a bad album, it just would've been much better five or ten years ago.